The newly constituted Economic Advisory Council to the Prime Minister (EAC-PM) wants the government to stick to its fiscal consolidation road map and has suggested that stimulus to the industry should not be at the cost of fiscal prudence. The Council, which met for the first time on Wednesday, has identified 10 themes, including economic growth and job creations, that need attention. Chief Economic Adviser Arvind Subramanian gave a presentation to the council on ways to accelerate economic growth, including investments and exports by using a combination of different policy levers. "We will come out with implementable solutions for economic problems and present them to the prime minister," council's chairman Bibek Debroy told reporters after the meeting. 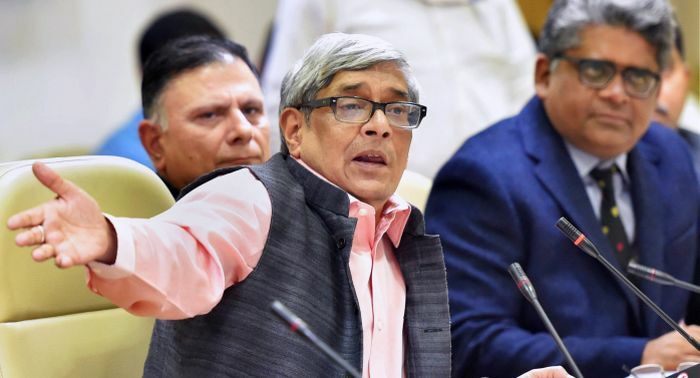 When asked whether the government can breach fiscal deficit to provide stimulus to the industry, Debroy said, "There is a consensus (among the members)... that the fiscal consolidation exercise should not be deviated." The industry is seeking fiscal stimulus to tide over the economic slowdown. The economic growth has slipped to a three-year low of 5.7 per cent in the first quarter of the current fiscal. The government pegged the fiscal deficit target at 3.2 per cent for the current fiscal and 3 per cent for the next financial year. The council has been set up with the approval of the prime minister on September 26, 2017. Its members are Principal Adviser to NITI Aayog Ratan P Watal as member secretary and Surjit Bhalla, Rathin Roy and Ashima Goyal as part-time members. Debroy further said the council will have another formal meeting in November. "Today, it was the first formal meeting. We will also have smaller meetings with stakeholders...We will also have another formal meeting next month and give recommendations to the prime minister," he said. Debroy also said the Council can consult the Reserve Bank of India on issues related to monetary policy and better transmission of policy rates. According to an official statement, another key issue recognised was effective tracking of key economic parameters, through possible mechanisms for instituting an 'economy track monitor' using lead indicators and trigger for action, based on informed assessment and analysis. "It was also agreed that specific issue paper will also be brought out by the members to address key concerns and linkages will be established with key national institutions," it said. The statement noted that the deliberations of the new EAC-PM also reflect its value addition as an independent institution mechanism to provide informed advice to the prime minister on addressing issues of macroeconomic importance. Modi, Jaitley must fix the economy jat pat!